In a house full of young boyz, monsters are the perfect Halloween decor choice. I then spent the better part of three days checking every craft and fabric store in my surrounding area for purple faux fur. I came up empty handed. At my last stop, JoAnn’s, I was disappointed but determined to make this work. I wandered the aisles and came across the feather boas. I chose two bright blue, and right away they gave me that Sesame Street, Muppets kind of feel and I was sold. I wrapped the boas around the form and hot glued as I went along. I wanted to add a little more oomph than the orignal inspiration, so I took pipe cleaners out and wrapped them along the length of a pen. The clip held them in place while I wrapped and then they all came out uniform and the same size. I then just pressed them into the wreath form, as they are metal at the core. Add the ribbon to the top and your finished! We all love how it came out! This is sure to be a staple in our family for some time. I can’t wait to show you what we are going to decorate the trees outside our front door with next week! What a fun project! I really love the colors! Newest follower! 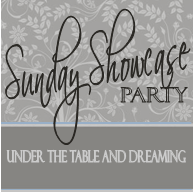 COme visit me at http://www.barefootbysea.blogspot.com! 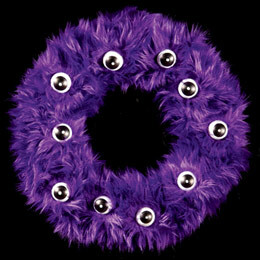 Love your monster wreath…featuring you on my blog.